A Republican party official says her email with the face of President Obama on the body of a chimp isn't racist at all, and it's the media who are "mak[ing] this about race." According to the NY Daily News, Marilyn Davenport, a Tea Party activist and member of the Republican party central committee of Orange County, CA, sent an email Friday with the above image and the caption "Now you know why — No birth certificate." Now, Davenport has fauxpologized, saying, "I'm sorry if my email offended anyone. I simply found it amusing regarding the character of Obama and all the questions surrounding his origin of birth." See, she was just saying Obama has a chimp-like character. This, she explains, is not racist at all: "In no way did I even consider the fact he's half black when I sent out the email. In fact, the thought never entered my mind until one or two other people tried to make this about race." This is implausible for a number of reasons. First of all, Davenport has a history of defending other politicians who made racist statements, including the former mayor of Los Alamitos, CA, who sent around an email with a picture of a watermelon patch in front of the White House (no doubt he was just trying to make a harmless joke about agricultural policy). Second, we've been through all of this before: even before the President took office, stuffed monkeys with Obama stickers on them were showing up at Republican rallies. 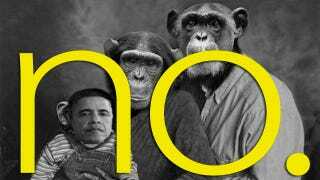 In 2009, the New York Post drew criticism for a cartoon depicting the author of the stimulus bill (a bill championed by Obama) as a dead chimp. And for a time, a cartoon depicting Michelle Obama as a chimp was the top Google Image Search result for her name. Basically, we've all had a good long time to discuss the racial undertones of comparing black leaders to chimps (and why that's different from the equally sophomoric but not racist Bush or Chimp?). Now, maybe Davenport doesn't agree that comparing a black person to a non-human primate — and thus adding to a history of bigotry including the racial slur "porch monkey" — is offensive, or maybe she doesn't care. But her argument that she just didn't know her email might be interpreted as a racial comment rings false. As a private individual, she is just real big on Birther stuff. One of her passions that drives her is the president's lack of forthrightness about where he was born. Marilyn believes that nobody knows where he was born and so this picture says a thousand words. Sorry, being an idiot who believes in absurd conspiracy theories is not a valid excuse for ... well, anything. A number of Republicans have condemned Davenport — Orange County Republican Party chairman Scott Baugh says her email was "a despicable message, it drips with racism and I think she should step down from the committee." However, according to the group's rules, the most it can do is censure her. And Davenport says, "I will NOT resign my central committee position over this matter that the average person knows and agrees is much to do about nothing." Well of course — somebody has to fan the flames of the inane birth-certificate controversy using the most offensive means possible. Otherwise people might get some actual work done.